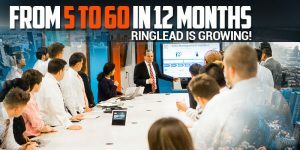 MELVILLE, N.Y., January 31, 2018 (Newswire.com) – RingLead, a leading data management provider, today announced a milestone of hiring 60 employees at its Long Island headquarters within its first year under the new leadership of Chief Executive Officer, Christopher Hickey, and Executive Chairman, and CA Technologies Co-Founder, Russ Artzt. The achievement of this milestone comes after RingLead’s yearlong focus on closing remote offices and relocating industry veterans to its headquarters to train, mentor and develop top talent from leading universities across the country. Fueled by their combined 75 years of business experience, Russ and Chris spent their first year at the helm zeroed in on building a sustainable recruitment strategy that would attract the most talented homegrown candidates available. Both CA executives have built their lives on Long Island, including expansive careers, families and home ownership, and remain committed to growing employment opportunities locally. Experience has shown me that creating a high-growth, sustainable SaaS team is no different than managing a high-performing sports franchise. We source the right talent, pair them with industry veterans, allot them the time to develop, and then, when they’re ready, position them to win. A large percentage of RingLead’s recent hires hail from top universities around the tri-state area including Stony Brook University, Stevens Institute of Technology, Farmingdale College, and St. Joseph’s College, filling roles throughout development, finance, sales, marketing, and recruitment. Graduates traditionally begin as interns or part-time employees, giving them adequate time to ramp and achieve professional milestones related to their career path. Upon hitting their milestones, candidates are offered full-time positions with RingLead and equipped with additional training and support for long-term growth. At point of hire, all employees become eligible to own stock in RingLead. Stock vests immediately after being earned and is rewarded after an individual achieves clearly outlined expectations on 12 monthly reviews. RingLead University, a blended, online training platform consisting of both instruction from senior managers, and online video training, is an integral component of RingLead’s recruitment and growth strategy. RingLead has observed tremendous improvement in its ability to retain and scale employees by providing 20 hours of professional development and training a month per employee. Hickey personally directed the creation of RingLead University to ensure all employees, regardless of their department, receive individual learning plans tailored to their career paths. To support its rapid growth, RingLead doubled the square footage of its Melville headquarters and equipped the new high-tech space with sound-proof, 4K video demo rooms, Amazon’s Alexa, and interactive leaderboard displays. A 50-foot, custom built, solid wood table sits at the center of the expanded wing, serving as a common space for Hickey’s daily team meeting to review product training, metrics, and company updates. RingLead remains committed to fueling employment opportunities on Long Island and will host its second summer internship class beginning in June. RingLead will employ top talent for the duration of the summer and select its next class of new hires at the end of the program. RingLead is already receiving summer internship applications from candidates worldwide. For more information on all available opportunities at RingLead, please visit www.RingLead.com/careers.